In his second inaugural address, Republican Gov. 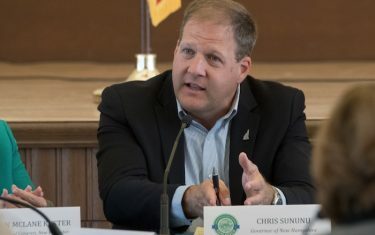 Chris Sununu touted the successes already seen by the relatively new Department of Business and Economic Affairs. But a recent analysis from Forbes shows that Director Taylor Caswell and his team at the BEA still have their work cut out for them. The annual “Best States for Business” study ranked New Hampshire as just the 34th best state in the nation, the second year in a row that the Granite State landed at that level. The numbers under Sununu’s guidance, while less than ideal, mark a reversal of the trend during the four years of former Democratic Gov. Maggie Hassan. New Hampshire was ranked 31st by Forbes in Hassan’s first year in office in 2013 before dropping to finishes of 35th, 37th and 36th in the next three years. Forbes pointed to natural and human resource challenges as some of the main problems for New Hampshire. The analysis also noted that New Hampshire led the nation in lowest poverty rate and was sixth-best in unemployment rate. Study author Kurt Badenhausen collected “41 metrics across six main categories: business costs, regulatory environment, economic climate, growth prospects and quality of life” in compiling the state rankings. North Carolina came in first in the 2018 rankings, and Alaska was 50th. Among New Hampshire’s regional neighbors, Massachusetts was 19th, Connecticut 40th, Rhode Island 43rd, Vermont 47th and Maine 48th. Forbes had the Granite State listed 45th overall for business costs and 38th for regulatory environment despite efforts during Sununu’s time in office to improve the business climate. Still, businesses are choosing to locate in New Hampshire. In his Jan. 3 address, Sununu listed several recent new business ventures in the state, including Hitchiner in Milford, Lorza in Portsmouth and BAE in Merrimack, among others. And the governor vowed to address the workforce shortage both through investments in education and in work requirements for people in the state’s Medicaid expansion program. Noting: “former Democratic Gov. Maggie Hassan. New Hampshire was ranked 31st by Forbes in Hassan’s first year in office in 2013 before dropping to finishes of 35th, 37th and 36th in the next three years.” Hassen is a liberal from MA. Shows repeatedly, Dems always take matters down, leaving a disaster. Now she in the Senate, gathering a taxpayer check and do nothing. VT has been nothing but down. Not mentioned, the NH Legislature is controlled by Dems (40 new faces from the large liberal towns) and haven’t allowed Sununu to implement some of his aspirations. NH is still very attractive. That’s why VTer’s go there to shop and some moved to from VT.
NH had two Dem Governors before Sununu, Shaheen (a former teacher) & Hassen (background stated), both Liberal. Shaheen also is a Senator, nothing much from her either. NH is far better than VT regardless. Guess it’s too far for the NY Flatlanders to move to and take NH down as they moved to VT and are taking VT down. To be fair to NH, it more that other states are improving and NH has remained static. VT continues to be at the bottom. Well, because a state can’t get much worse then VT in terms of a business friendly climate. OKay maybe it can be. VT could sink to 48,49 or 50th. Rest assured the coming carbon tax will seal the deal there. And then we’ll be a satrap for rich kid do-nothings who’ll deafen us with their eternal moralizing as to the value of being poor and jobless…even they they’ve never had to work a day in their lives. We’ll be kind of like a repository for this type being kicked out of Massachusetts, Conn. and NYC (as well as California and Colorado if their trust funds reach all the way back to the east coast & a lot of them do). You know: the ancestors who busted their asses to get these worthless sons and daughters into positions to do nothing but pretend they’re “back to the land” and moralize to those who work or have had to their whole lives?